Now, if you are looking for an entry-level mirrorless digital camera that can give you high performance level as well as a great deal of flexibility and versatility to handle any condition and goal, look no more. Meet Fuji XA3 and Sony a6000. These two products are very popular on the market because of such qualities. They are also available in a more-or-less similar price range. Now, to choose between Fuji XA3 and Sony a6000, let us see the differences and comparisons between them. As mirrorless digital cameras, both Fuji XA3 and Sony a6000 are certainly very compact and portable, especially if you compare them to their DSLR distant siblings. 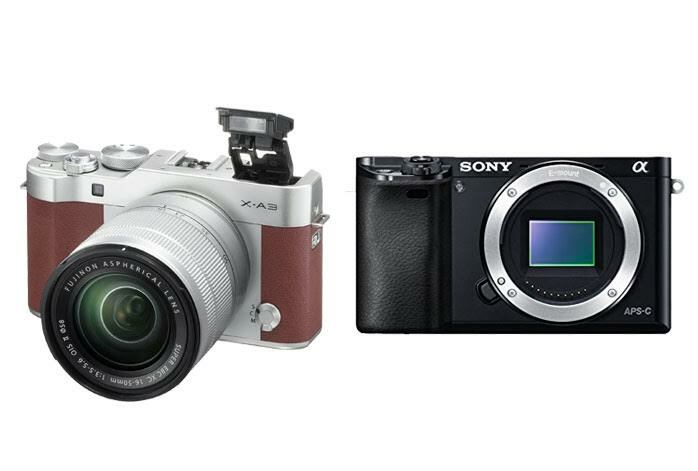 Nevertheless, Fuji XA3 and Sony a6000 are roughly of the same size and weight. They each come with an interchangeable lens system, so you can pair them with various compatible lenses to fulfill any need and face any challenge. They each also have a tiltable display screen, allowing you to conveniently shoot your pics from difficult angles. However, Fuji XA3 has been equipped with a touchscreen for intuitive and practical control. Well, Sony a6000 has no touchscreen, but it comes with a built-in electronic viewfinder that promotes better framing. Both Fuji XA3 and Sony a6000 are relying on a 24 MP APS-C CMOS image sensor. They can easily capture large-sized images with superior details. The colors are also vibrant and vivid, with exceptional depth and dynamic range. However, Sony a6000 offers much higher maximum ISO of 51200. Combined with the decent 1/4000s max shutter speed, you can be very creative with your shots in any lighting condition. On the other hand, Fuji XA3 only has 25600 max ISO, but offers up to 1/32000s shutter speed. The ultra-fast shutter is beneficial if you want to shoot wide open under an extremely bright light. Anyhow, Sony a6000 also boasts a more powerful AF system. Fuji XA3 is rather pale when it comes to sports photography as its 77-point AF is solely contrast-based. Sony a6000 comes ready and confident with 179 focus points and hybrid AF that combines both contrast detection and phase detection for maximum performance. In addition, Sony a6000 also has an excellent continuous shooting speed of 11 fps and a significantly larger buffer size than Fuji XA3. Sony a6000 has proven itself to have lots of value. Compared to Fuji XA3, Sony a6000 offers better performance levels. It is very flexible and versatile. And, the built-in electronic viewfinder seals the deal.